Beaune: the "Capital of Burgundy wines" is a fortified medieval city of 22,000 inhabitants known for its quality of life. In the 15th century, Beaune changed its destiny when Nicolas Rolin built the famous hospices or Hôtel-Dieu. 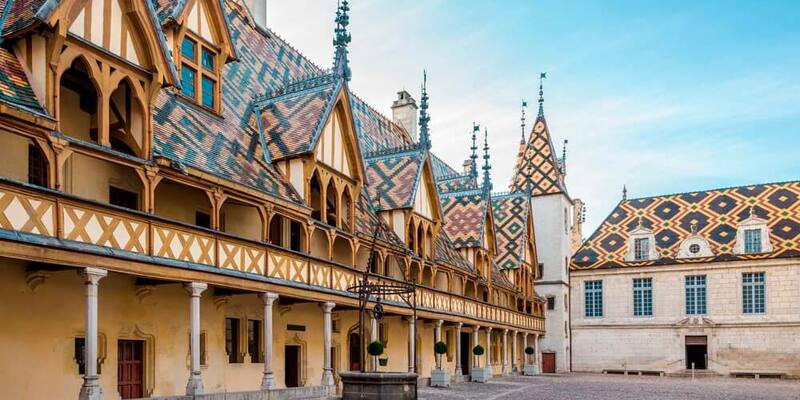 This striking Gothic building with its glazed tile roof has become an emblem of Burgundy. Each year, the Hospital which owns more than 250 acres of vineyards sells its wine production through auction to finance its investments. Dijon: the capital of the former Duchy of Burgundy is a very pretty city of 155,000 inhabitants. Nicknamed the city of 100 steeples, Dijon host a rich historical and cultural heritage. It knew its apogee between 1363 to 1477 under the reign of the four Valois dukes of Burgundy who controlled a territory which extended until the Netherlands. Today, Dijon is a beautiful city with a high quality of life and a recognized gastronomy. Burgundy wines and vineyards between Chalon-sur-Saône and Dijon: For 2000 years, the Burgundy vineyards have combined the generosity of the soil and the work of men to create mythical wines. Côte de Nuits: situated between the Capital of French Wine Beaune and Dijon, this vineyard is the homeland of the legendary Pinot Noir grape. The Côte de Nuits area feature 24 Grand Crus Classed wine all reds. The most famous ones are La Romanée-Conti, La Romanée, Clos Vougeot, Echezeaux, Grands Echézeaux, Chambertin, Chambertin-Clos, Musigny, etc. The Cote de Nuits vineyards covered 14 communes but only 10 produce Grand Cru classed wines: Gevrey Chambertin, Morey-Saint-Denis, Chambolle-Musigny, Vougeot, Flagey-Echezeaux, Vosne Romanée, Nuits-Saint-Gorges, Premeaux-Prissey, Comblanchien and Corgoloin. Côte de Beaune: located 150 km north of Lyon, starting in Santenay and finishing between Beaune and Cote de Nuit appellation, this vineyard is the homeland of Chardonnay Grape. Côte de Beaune gives birth to 7 White Chardonnay Grand Crus (Corton, Corton-Charlemagne, Bâtard-Montrachet, Montrachet, Bienvenue-Bâtard-Montrachet, Chevalier Montrachet, Criots-Bâtard-Montrachet) and only one Red Pinot Noir Grand Crus, also called Corton. Côte de Beaune features many Premier Cru classed red and white wines in world known town names as Pommard, Volnay, Meursault, Puligny-Montrachet, Blagny, Ladoix-Serrigny, Saint Aubin, etc. Côte Chalonnaise: this vineyard is named after the town of Chalon-sur-Saône, located on the Saône River, 130 km north of Lyon. The principal grapes varieties of Côte Chalonnaise are Chardonnay & Pinot Noir with some plantations of Aligoté in Bouzeron town and also some Gamay. 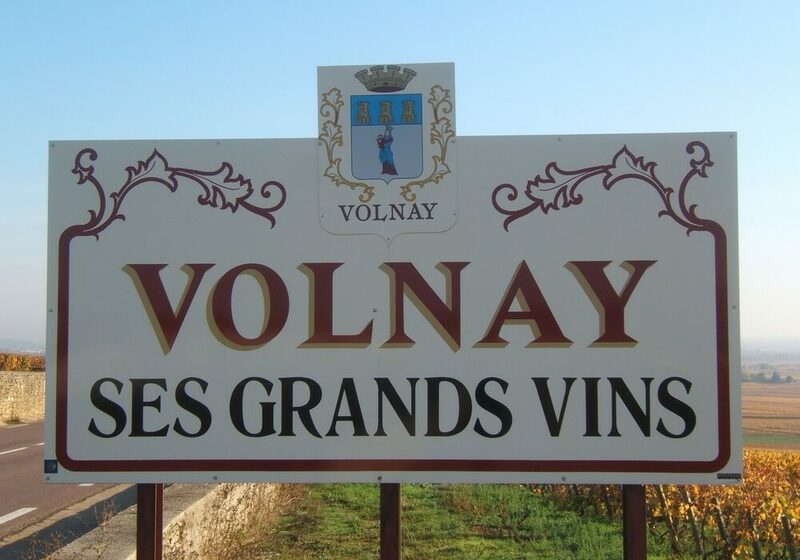 The communes of Rully, Mercurey, Givry, Montagny features some Premier Cru classed vineyards but currently there is no Grand Cru classed vineyards in Cote Chalonnaise.